RV carbon monoxide poisoning is a serious issue -- especially in the winter months! Here's everything you need to know about carbon monoxide poisoning as it's related to the use of RV catalytic heaters and RV propane. 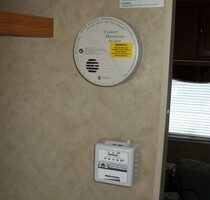 Plus RV alarms you need to have onboard (like CO2 detectors). Maybe it’s time to find a different source of heat to keep you warm inside your RV. Have you considered a catalytic heater? Catalytic heaters require no electricity to operate. Catalytic heaters also consume propane at a much slower rate. Every RV is set up with a different combination of power sources. Propane is one of the most popular alternative power sources for RVers. 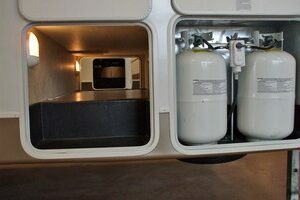 Today’s RVs, regardless of size or class, make use of propane in many ways. The most common use for propane is to provide a way to cook meals, though in most recreational vehicles it does so much more. 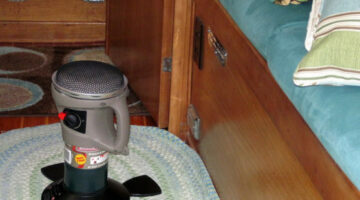 Propane is the most versatile system in your RV. Without it, today’s RVs would be rather impractical. Here are basic facts about RV propane generators, ways to use propane on your RV, and where to refill propane tanks. New RVs are safer than ever — with all of the safety alarms and detectors that are factory-installed. But, if you’re buying a used RV, then you may need to add an RV alarm or two yourself. Here is a list of RV alarm and safety detection equipment that you need to have on board at all times. Here are some of the detectors and monitors inside your RV that need to be checked each year — and have a fresh set of batteries installed. Is it possible to survive the winter months in an RV? Absolutely! Here’s how to retain heat inside your RV, how to keep the RV water line from freezing, tips for winterizing the sewer line, and how to make sure you always have enough propane on hand.